I adored this novel. The Guns Above has heart and gumption and sass and a brilliant leader in Captain Josette Dupre. I went into The Guns Above not knowing much outside of flintlock + airship + military. Now, I want all things Dupre! Basically, The Guns Above reads like the first episode in a series you wish you could binge watch all weekend. Garnia is at war with Vinzhalia over the territory of Quah. Garnia has been at war for generations, so long that many have lost sight of the real reasons they are even fighting beyond the pride of winning. Recently promoted Senior Lieutenant Josette Dupre is made captain of the airship Mistral, a new and untested design, due to unwittingly making a splash in the newspapers after a particularly epic air battle where Dupre and a sergeant are the only survivors and managed to help turn the tide for the infantry on the ground. The Aerial Signal Corps is often mocked by the regular army and Dupre's headlines make an enemy of General Lord Fieren, the army's commander. Aside from the insult of an airship taking the battlefield glory, a woman gaining all the recognition is too much for Lord Fieren. Giving Dupre command of the Mistral, a chasseur class warship built to withstand cannon recoil, Fieren hopes to prove her unfit and unworthy of all the praise. He even goes so far as to plant his nephew, Lord Bernat Manatio Jebrit Aoue Hinkal, a spoiled, flirtatious aristocrat, as an observer (read spy) to report directly to him on Dupre's actions. We enter the story mid-war right after a very recent battle where Dupre has little time to do much else other than dust herself off after waking in the hospital before having to report to Lord Fieren for what she fears will be her end. Instead she finds her new found newspaper fame has earned her a Royal promotion to Senior Lieutenant, a rank never before held by a woman. Dupre engages Sergeant Jutes, the other survivor from the now infamous crash, to help her take the Mistral in the air. Dupre lives and breathes all things airship. With a a mere touch she knows what her ship is telling her even before her crew can call it out. Her expertise is unparalleled but being the first woman to have earned the rank of Senior Lieutenant ever as well as being the first woman given an airship command, she has a lot resting on her shoulders to prove to her crew and fellow airship captains. Despite Lord Hinkal's privileged, and very sheltered, status he does eventually worm his way into the heart of the Mistral's crew. He is a pompous man and we see him towing the line on every possible stereotype for women serving in the military and in command. But Dupre's skill and courage prove to Hinkal she's more than worthy. The back-and-forth between Hinkal and Dupre are a vital pulse point within the novel. We see Dupre having to suffer the uppity aristocratic attitude in stride as he is a civilian and she is under orders from Lord Fieren to give him unrestricted access. By turn we also see Hinkal getting to experience life outside his normal cushy digs for the first time. Both are incredibly witty with razor-sharp wit causing many humorous exchanges where I found myself laughing out loud. What I love most about the relationship forming between Hinkal and Dupre is that Bennis leaves it at a friendship level. There isn't the weight of potential romance hanging in the air. We get to see characters flourishing in their element as individuals and as part of a crew. It was refreshing. 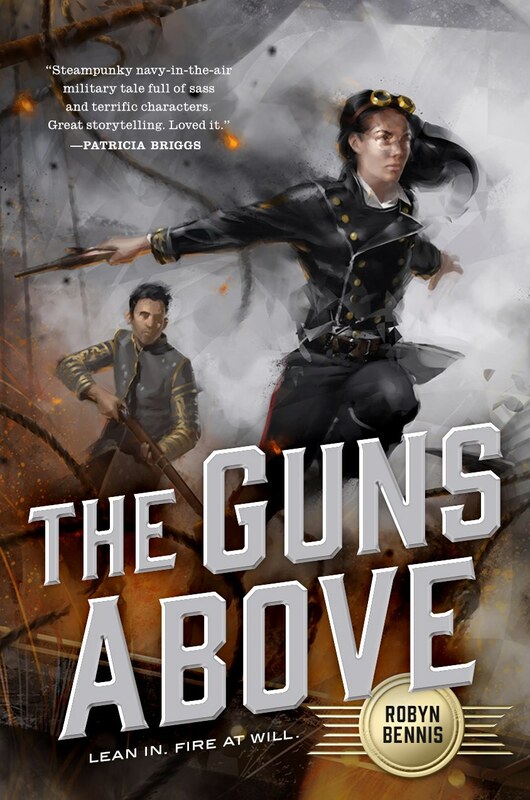 More than anything else, The Guns Above is a supreme adventure story. I mean, Bennis has put epic naval battles in the air, talk about taking it up a notch or four. In the sea, if there was a man overboard, there might still be a chance to pick them back up. In the air, a man overboard pretty much means certain death. The battle scenes, even smaller ones, are thrilling and I couldn't help but hold my breath. Bennis hits it out of the park with this series opener and I can't wait for the next installment. I am thrilled to have Robyn Bennis joining the flintlock adventure ranks. Nerd Coefficient: 9/10 - This book is pure flintlock awesomeness!